Are you wondering what it is like to be out visiting with Lily? It is a humbling experience, and every time we go out with Lily, we are amazed by the work she does, and how it benefits the people we visit. And, how we are personally changed by these visits. We are honored to continue Lily’s work in 2016, and it is full of excitement, joy, and wondering about what the new year will bring. Lily and her team will be out seeking the lonely, the sick, and anyone needing comfort. We will continue with our regular weekly visits to all our friends, but we will be on the lookout for new friends. So what is it really like to be with Lily on her visits? What it is like to enter a hospital, a skilled nursing facility, or even a funeral? What do you say? How do you enter a room where people are suffering or are lonely, depressed, confused? Well, you take a deep breath and Lily takes over. We start by asking if anyone would like to pet the dog. This is all one needs to do. Lily does the rest. Having a partner with you is helpful, too, because often a handler is busy watching out for Lily, and the partner can see who might be interested in seeing the dog. You can tell who is interested by the look of sheer delight on their face. Once someone is petting Lily, we stop talking and we listen. People will say things that are on their mind. Some talk about the pets they used to have at home. What a loss for them to have to leave their pets once they come to a facility. Some cry when they see Lily because they are remembering their own pets. I always ask what their pet’s name was. This usually gets them talking about themselves a bit. I have met many pets through our visits: Patch, Owen, Tommy, Sammy, King, and Mitzie, to name a few. But, when I close my eyes after a visit, I remember the smiles on so many faces when Lily enters the room. There are only a few people we visit that don’t like animals, and ask not to get Lily near them. But, I noticed that in the last few months, some of those people are starting to soften and I can at least have Lily near them. And I still get to visit with them without them petting Lily. And Lily takes all this in. She looks at her friends, and lets them love on her. She goes to everyone, and she snuggles. And she smiles…a big, big smile for all her friends. This is what a day is like with Lily. It is a perfect verse for Lily. Are you a Comfort Dog Handler, or have you been visited by a Comfort Dog? Please share your experience in the comments, below. We would love to hear from you. We are a “Comfort Dog in Waiting” church in Memphis. We look so forward to the day we will be able to spread this comfort and compassion in Memphis and our surrounding community. Thank you so much for sharing a day in the life of Lily! It is good to hear from you, Barbara. Let us know when your comfort dog arrives. A very well written blog, Marianne……it’s the closest thing to going out with one of the dogs. Too bad everyone can’t do that. I’m a handler and Facebook voice for Cubby Comfort Dog. I never cease to be amazed at how much that one dog can do for hurting people. Also, that one dog senses the person who is the neediest. 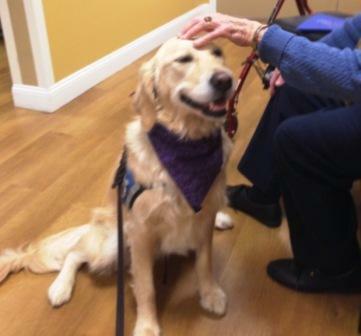 The Comfort Dogs are such a wonderful ministry….it’s a privilege to be part of it. Thank you, Marilyn God gave us such a gift when making dogs. There are so many stories of the amazing things they do. I am glad you are able to experience this gift. The same things happen when we are out with Lily’s brother — Noah Comfort Dog. They are litter mates and both are wonderful Comfort Dogs. He’s even visited in Memphis! I’ve been following the comfort dogs ever since I heard about them being at Sandy Hook. 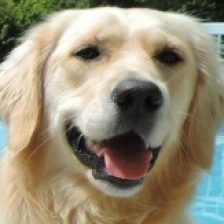 I had tears in my eyes when I read about what it is like spending a day with Lily and often get tears in my eyes when reading the Facebook posts of the other comfort dogs. The videos that LCC posts (Kare 9 Launch, Wags N Tales) and news stores (Good Morning America, Anderson Cooper) are awesome. I’ve attended a few events that the comfort dogs have been at. My only wish would be that the teams would post on Facebook a few days in advance some of the events or places that they are going to attend with the comfort dogs. LCC used to do this on their site. Reading about a visit that one of the comfort dogs that I follow on Facebook made to a pet store that I could have gone to if I had known about it earlier was very disappointing. Thanks for your comments, Mary Ellen. Lily’s calendar is posted on her web page!